Extensive customer research and member feedback is driving the new mobile app experience and will continue to do so as part of Marriott’s ongoing service innovation strategy. Since Marriott became the first hotel company to offer Mobile Check-in/Checkout and Mobile Room Ready Alerts worldwide in 2014, more than 12 million members have taken advantage of it. The popular feature will now be easier to use and more powerful. For example, when members check in using the app, for the first time they will now be able to request room upgrades and receive notification it has been fulfilled before they arrive. Also for the first time, they will be able to request a late check-out in the app rather than at front desk, which is guaranteed for Gold and Platinum Elite Members. 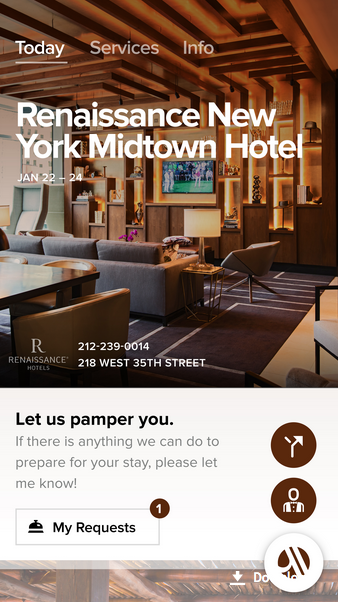 With the app’s innovative new navigation, members will find it even easier to customize their stay with Mobile Requests. Guests can use the app to chat directly with hotel staff before, during and after their stays for special requests that require personal attention, or choose from a drop-down menu of the most frequently requested services or amenities such as more towels or extra pillows. Fully 54 percent of users make their requests before they’ve even checked-in. Having been the first to offer Mobile Requests globally beginning in 2015, the service is currently available at more than 4,000 hotels worldwide. 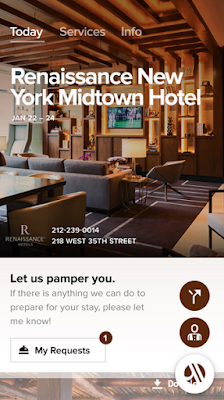 With the app relaunch, Marriott is also expanding Mobile Key, rolling out to more than 500 hotels globally this year. Members who check-in using the Marriott Mobile app can choose to skip the front desk and go straight to their room, using their smartphone to open the door. For travelers in planning mode, they will now be able to precisely narrow down their destination searches by address or point-of-interest to find the closest, most convenient hotel, and to save their favorite hotels for quicker future bookings. Increasingly, travelers are seeking more authentic destination information from local experts whether they’re choosing where to go or looking for tips for what to do once they get there. For the first time, the app will deliver curated, original content from Marriott’s digital magazine, Traveler based on users’ previous hotel searches or upcoming travels. Lufthansa's has some great deals on their flights between Canada and Europe. You can fly Montreal-Paris for $779, Toronto-Helsinki for $829 and more! Book by Feb 14. Find out more here. - 1,000 Bonus Gold Points when you download the Club Carlson mobile app and book and complete your first stay. More... Until ?